Panchvati Perfumed Dhoop Sticks are made from famous Musk, Sandalwood and other best quality Indian Perfumes. These are a favorite of the shop, and one of our all-time Best Selling Indian Incenses. The commitment is small since these sticks are just 5" long and come 10 per box. 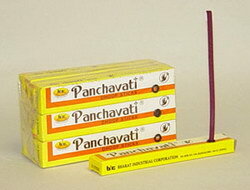 Some incense gets "old" when the same scent permeates a space, but never the Panchavati Dhoop sticks. I've been burning this particular scent of Indian Incense for about 10 years, and just like Nag Champa; I don't think I could ever get "incense fatigue" from this Dhoop stick.